I’ve been looking into vegan butter alternatives that don’t involve palm oil. Butter, vegan or otherwise, should be solid at room temperature. This means that it must have saturated fat. Unfortunately, the cheapest sources of saturated vegetable fat are hydrogenated vegetable oils (which have trans fats, which are banned in California due to health concerns) and palm oil (which is a major cause of rainforest destruction). Virtually all store-bought margarines are based on one of these ingredients. 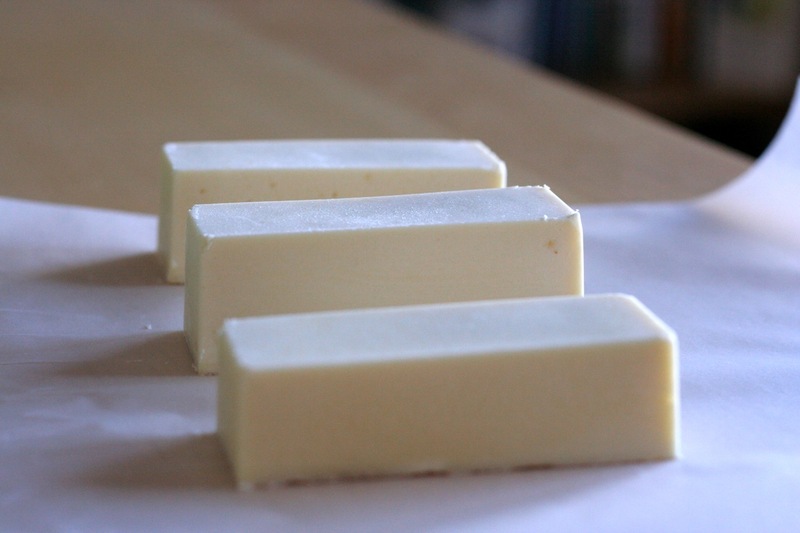 Luckily, we can make homemade vegan butter from refined coconut oil! I’ve tried two vegan butter recipes so far. The first I found on Luminous Vegans, and is based on a recipe by Miyoko Schinner. It worked great, although I didn’t take photos. The second, which I’ll discuss here, is the basic coconut oil butter recipe by Mattie at Veganbaking.net. The two recipes are very similar, with the same ingredients in slightly different proportions (with the exception of xanthan gum, which is only in the Veganbaking recipe). Combine soy milk and apple cider vinegar, and let it sit for 10 minutes or so to curdle. Warm refined coconut oil until liquid, but close to room temperature. 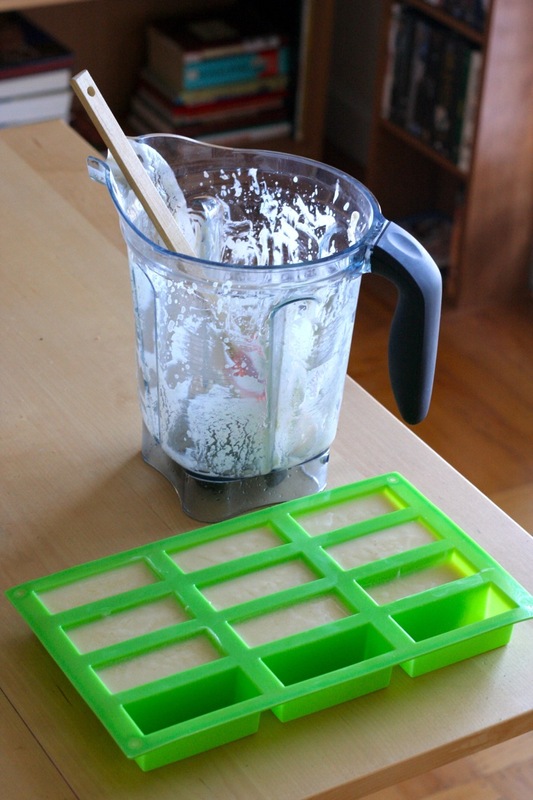 Pour into a freezer-safe container or silicone mold, and place in the freezer to rapidly cool. Remove from mold and enjoy! I doubled the recipe for easier mixing in my blender, and to match the batch size for Miyoko Schinner’s recipe. I also used a bit more salt than called for — 1 tsp versus 3/4 tsp; the original 3/4 tsp is probably about right. Vegan butter mixed and poured into a mold. I took Veganbaking’s recommendation and got a silicone mold. They recommend the Tovolo King Cube mold. I wanted a rectangular shape, so I got this Allforhome rectangular mold. This mold makes nice butter shapes, although they are smaller than real sticks of butter. I pre-chilled the mold to help the butter cool rapidly, since it’s important to solidify the butter shortly after it’s mixed, or it will begin to separate. However I took some photos between mixing the butter and freezing it in the mold, so this did cause some separation. Pro tip: You really want the butter to be level in the freezer, or you’ll get some slanted butter sticks. If your freezer looks anything like mine, that will require some planning in advance. I planned this imperfectly, and got some slightly crooked butter. 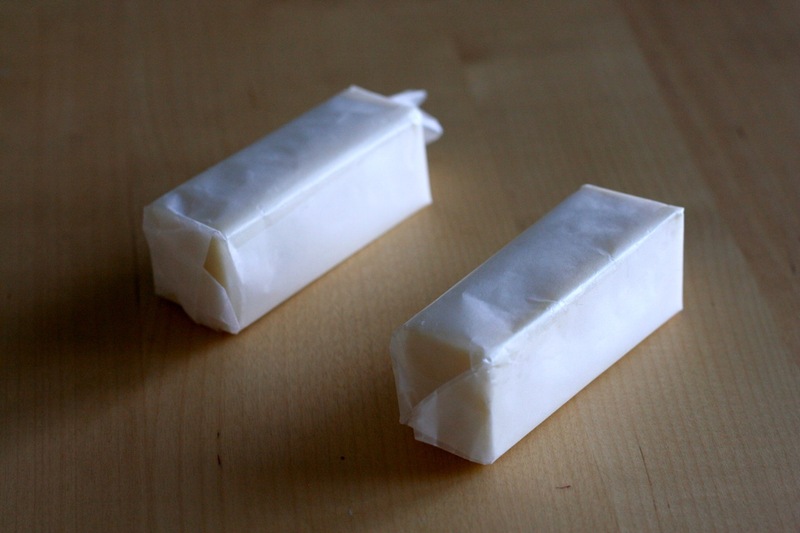 I wrapped the sticks of butter in wax paper for storage in the freezer. They didn’t quite stay wrapped as well as I’d have liked, but they look nice anyway. So enjoy! I’ll update with some pictures of the butter in action. This entry was posted in Recipe, Review and tagged butter, margarine, palm oil, recipe, vegan on February 2, 2014 by Ed Pizzi.